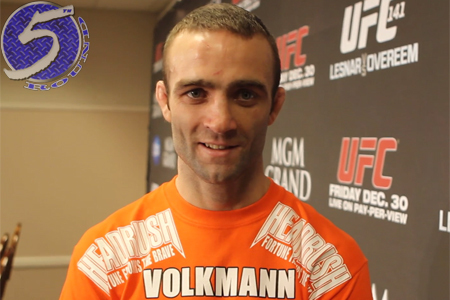 Jacob Volkmann (Pictured) told 5thRound.com he was unconcerned with receiving another visit from the Secret Service for going after President Barack Obama for the second time in less than a year, but it appears the UFC lightweight should have considered the ramifications from WBHS for his “glassectomy” joke. “Was put on administrative leave from coaching white bear lake high school wrestling for my joke. Unethical!” Volkmann posted on his Twitter. Following his UFC 141 unanimous decision victory over Efrain Escudero, Volkmann attempted to turn funnyman during his in-Octagon interview in front of a live MGM Grand Garden Area audience. “Obama needs a glassectomy. Ask me what a glassectomy is, Joe [Rogan],” Volkmann said to the UFC’s longtime color commentator. “It’s where they remove the belly button and put a piece of glass in there so you can see what you’re doing while your head’s up your [expletive],” Volkmann stated.